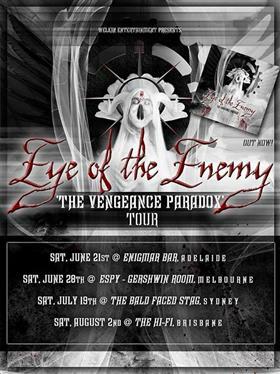 Eye of the Enemy have announced the exciting news that they’ll be touring a select number of shows across Australia. This will be the first time Eye of the Enemy will headlining a show of their own in four years. Off the back of recent stints such as the national support for Children of Bodom on their recent ‘Halo of Blood Over Australia’ tour and the release of their stellar second album, ‘The Vengeance Paradox’ (see our review here), Eye of the Enemy have been pulling up all aces in recent times.